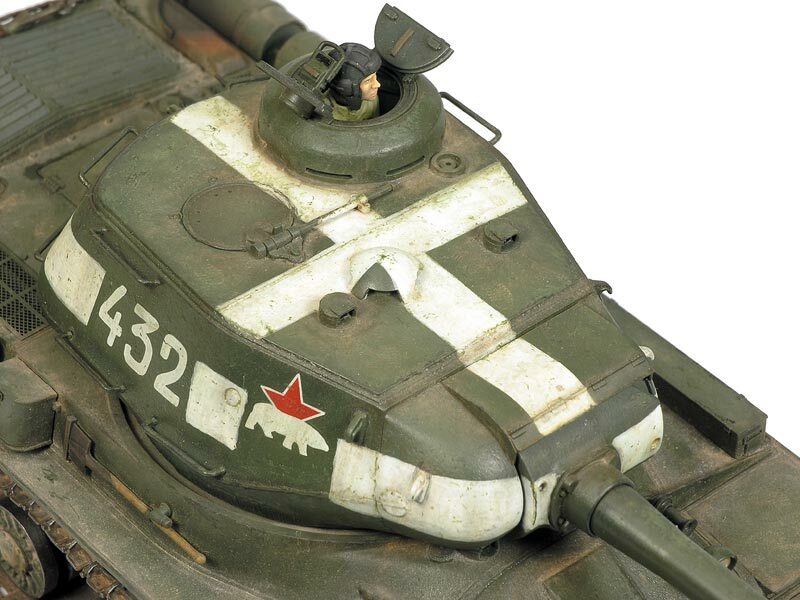 The tank battles of 1943 made evident for the Red Army the necessity of new tank designs, especially in the aspect of the main gun. The T-34 was a reliable machine and it was decided to continue its development upgunning it, which eventually led to the T-34-85. However, the KV-1 series tank did not perform very well against the new German tanks and thus it was decided to create a completely new heavy tank. In fact, preliminary work was already underway at Chelyabinsk. The resultant design used several components of the KV-13 universal tank, a project dropped soon before, with a new turret able to accommodate a new, more powerful 85 mm gun. Some of these new turrets were adapted to the KV-1s, in production by then, as a provisional solution to increase the firepower of the tanks sent to the front. 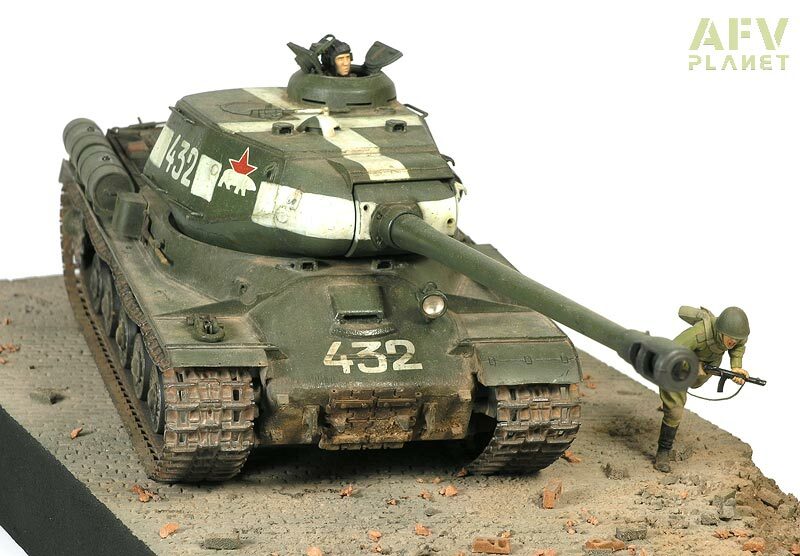 Around 130 of these tanks, named KV-85, were produced between September and November 1943. The new design of a heavy tank for the Red Army was named after the Soviet leader Josef Stalin. At the design stage, a 85 mm gun was considered enough to arm this new tank, and thus, the production of the JS-85 started at Chelyabinsk. However, soon afterwards this decision was reconsidered since the standard medium tank, the T-34 was upgunned to the 85 mm gun, and the now defensive role of the Wehrmacht made necessary a more powerful gun in order to break through the German defences as expected for a heavy tank, and a 122 mm gun was chosen. For this reason, the production of the JS-85 was cancelled at the beginning of 1944 after around 100 JS-85 had been completed, and the production of the JS-122 was started at the end of 1943. Around March 1944 the tanks were renamed, with the JS-85 becoming the JS-1, and JS-122 becoming the JS-2. The main disadvantage of the new 122 mm tank was that its D-25T gun has a two part projectile and, due to the its big size, just 28 of them could be carried. Also, the AP performance of the gun was not optimal, but it was consider sufficient by the designers. Also, it was detected that the front protection of the hull was insufficient against the last generation of German guns. This leaded to a redesign of the shape of this area of the tank. From summer 1944 the upper front plate was a straight plate inclined at 30 degrees, instead of a stepped one. Also, the thickness was augmented till 120 mm. The new tanks are sometimes known as JS-2m, but this seems to be a western designation, not a Soviet one (which seems to be JS-2 mod. 1944). There were two subtypes of this improved and reinforced nose found in JS-2 mod. 1944. The tanks built in the Chelyabinsk (ChKZ) factory had a one piece, cast nose, while the JS-2 built at the Ural Heavy Machine tool (UZMT) plant as a two pieces, welded nose. Several others modifications were introduced in these JS-2 mod. 1944, such as a widened gun mantlet or a slightly different arrangement of the periscopes on the turret roof. The JS started to be delivered to the heavy tanks regiments in February 1944 and it was very popular among their crews. 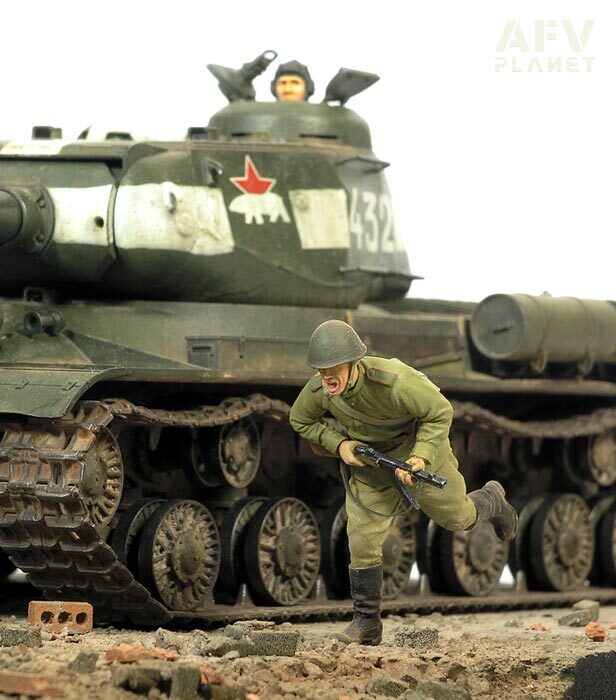 Along the T-34-85 the JS-2 tanks represent the typical image of the armoured Soviet power during the last year of the war. 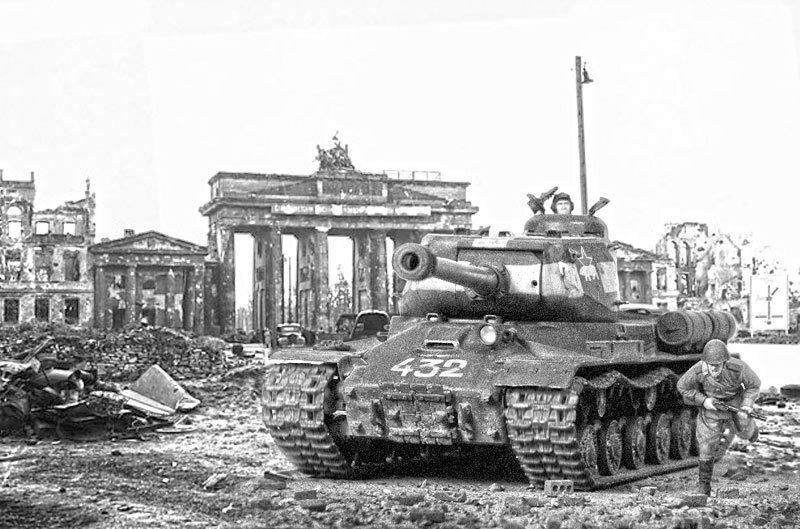 Photographs of JS-2 taken during the Reichstag fighting in Berlin are among the most famous WWII icons. Eventually, also other armies of Eastern countries under the control of the Red Army, such as the Polish or the Czech received JS-2 and used them against the Germans. 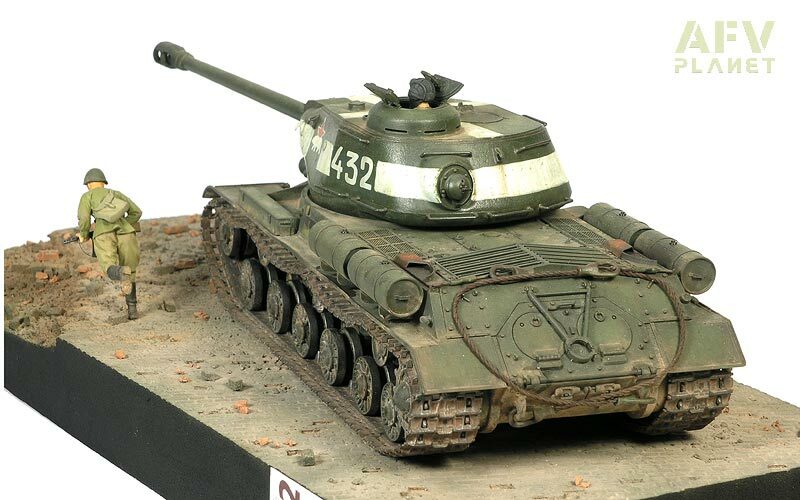 The JS-2 was the departure of a long career of Soviet tank designs that can be traced even till the present. The direct heir of the JS-2, the JS-3 was not used during WWII, but was publicly presented during a victory parade held in Berlin in September 1945, shocking the Western allies and influencing the tank design during the cool war period. The JS-2 itself was in service in the Soviet Army during manoeuvres until the eighties, and the official order to remove the JS-2 from service was only issued in 1995!. 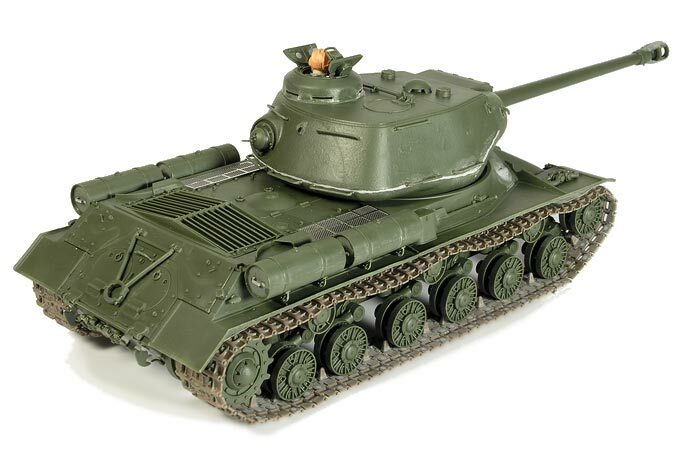 The release of the JS-2 by Tamiya at the beginning of 2008 came with certain surprise. 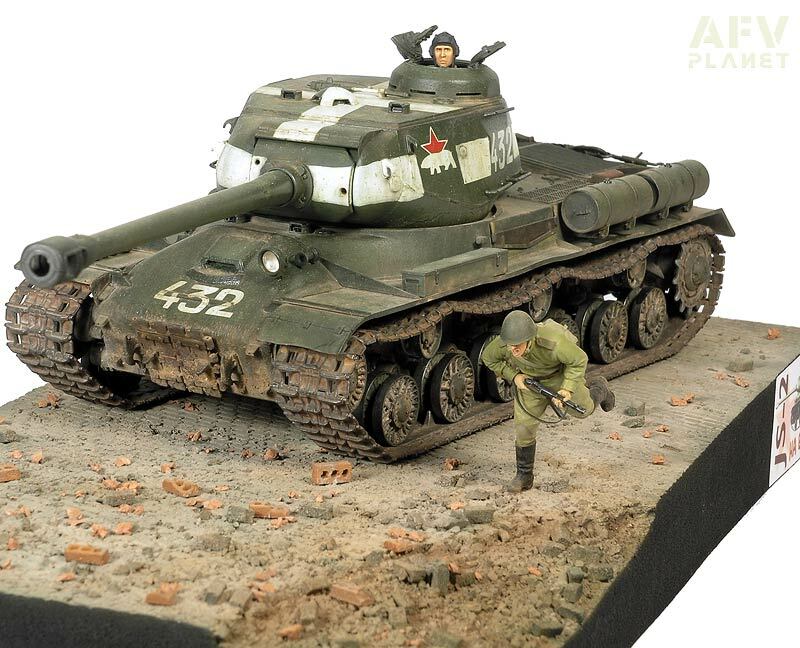 It was known that Dragon was going to revamp their now old Stalins with the “premium treatment”, a long awaited kit, but nothing was known about Tamiya’s plans. Anyway, the announcement of the new kit by the Japanese maker created great expectations, and modellers have not been disappointed. The Tamiya Stalin (ref. 35289) is a mod. 1944 of the ChKZ subtype. 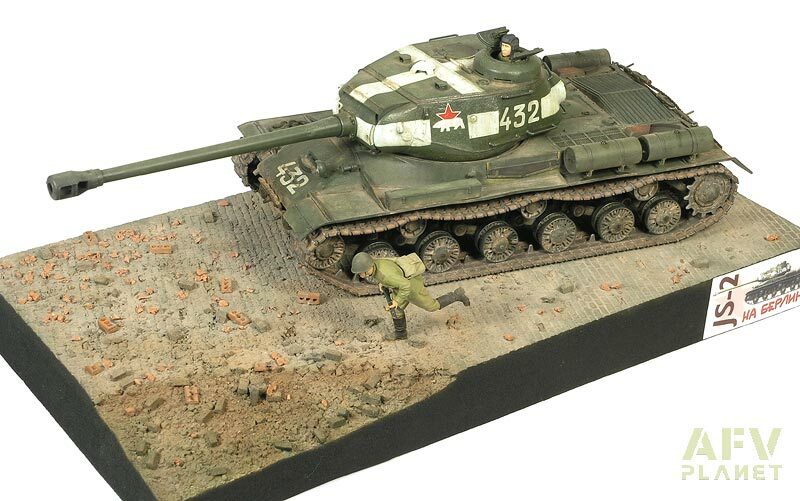 The quality of the kit is all that you can expect from the latest Tamiya creations, that is, exceptional. The kit is very well designed, with very well laid instructions and easy to build. The fit of the parts does not cause any problem at all, and almost no putting or sanding was needed in my model. The detail is crisp and abundant, the intake engine grilles are provided in the box as photoetched parts, and also a portion of twine for the towing ropes is in the box. Given the quality of the kit, I decided to build it strictly out of the box, with very few minor add-ons. Cuando la necesidad de reemplazar a los carros de la familia KV en el arsenal de carros pesados del ejército rojo fue evidente, el proyecto de desarrollo de un nuevo tanque tomó el nombre del líder soviético Josef Stalin. En la fase de diseño se consideró que un cañón de 85 mm sería suficiente, pero cuando el carro medio estándar, el T-34, fue actualizado con la introducción de una nueva torre con un cañón de ese calibre dando lugar al T-34/85, fue evidente que el nuevo carro pesado necesitaría algo más. En cualquier caso los primeros 100 JS salieron de la factoría de Chelyabinsk en 1943 con el 85 mm (JS-85), pero pronto se cambió la producción con la introducción de un cañón de 122 mm (JS-122). El nuevo carro empezó a distribuirse a las unidades en febrero de 1944 y en marzo los JS-122 pasaron a denominarse JS-2. El principal problema del cañón D-25T era el gran tamaño de su proyectil, separado en dos partes, lo que únicamente permitía llevar 28 a bordo del carro. En el verano del 44 se rediseñó el frontal del glacis, que pasó a ser una plancha plana sin el escalón de la versión anterior, un punto débil del carro. También se aumento su espesor hasta 120 mm. Esta versión suele conocerse como JS-2 mod. 1944 (o en la jerga occidental JS-2m). De paso, se introdujeron además otras modificaciones menores, como un mantelete del cañón más amplio o una redistribución de los periscopios en el techo de la torre. De este modelo 1944 existen dos sub-versiones. Una, fabricada en la factoría de Chelyabinsk (ChKZ) poseía una pieza frontal en el glacis de una sola pieza de fundición redondeada. Por otro lado, los carros fabricados en la planta de maquinaria pesada de los Urales (UZMT) resolvían esta zona con dos planchas de blindaje soldadas en ángulo. El JS forma parte de las imágenes típicas del avance soviético hacia Europa central a finales de la segunda guerra mundial. Algunas fotografías de JS-2 cerca del Reichtag se encuentras entre los iconos más conocidos del fin de la guerra. El Stalin no solo fue usado por los Soviéticos, sino también por Checos y Polacos en unidades controladas por aquellos. En cierto modo, el JS representa el comienzo de una larga carrera de carros soviéticos cuyo linaje llega prácticamente hasta nuestros días. El propio JS-2 todavía participaba en maniobras en los ochenta y no fue completamente dado de baja en el servicio hasta 1995. El lanzamiento de Tamiya de un nuevo JS-2 a principios del 2008 causó cierta sorpresa. Se decía por entonces que Dragon iba a aplicar a sus ya veteranos JS el tratamiento “Premium” para volverlos a sacar al mercado, pero la espera ya se estaba haciendo larga y nada se comentaba de la posibilidad de un nuevo Stalin por parte del gigante japonés. No es de extrañar que cuando se confirmó la noticia, esta causara cierta expectación entre los modelistas. Y desde luego, Tamiya no defraudó. El Stalin de Tamiya (ref. 35289) es un modelo 1944 del tipo ChKZ. La calidad del kit es simplemente la que Tamiya nos tiene acostumbrados en los últimos tiempos: excepcional. La maqueta esta muy bien diseñada, con instrucciones claras y sencillas y fácil de montar. En encaje de las piezas es muy bueno, sin problemas, y prácticamente no requiere el uso de masilla y lija. El detalle es fino y cuantioso, las rejillas de aireación del motor se incluyen en una pequeña plancha de fotograbado, así como una pequeña sección de cordón textil para confeccionar el cable de remolque. Dada la calidad de la maqueta, decidí montarla casi de caja, con añadidos casi sin importancia.